A Meckel diverticulum is an embryologic abnormality that is part of a spectrum of anomalies known as yolk stalk or omphalomesenteric duct remnants (see the images below). Fabricus Hildanus first described a Meckel diverticulum in 1598. In 1809, Johann Meckel, an anatomist, described this anomaly in detail. He identified the origin of the diverticulum as the omphalomesenteric duct and emphasized that this anatomic abnormality was a potential cause of disease. In 1904, Salzer became the first to identify ectopic mucosa within the diverticulum. Newborn infant with persistent omphalomesenteric remnant, which is being resected to prevent obstruction and to close umbilical defect. Image courtesy of Kenneth Gow, MD, BSc, MSc, FRCSC, FACS, FAAP. Large Meckel diverticulum on antimesenteric surface of terminal ileum. Image courtesy of Richard A Falcone, Jr, MD. The omphalomesenteric (vitelline) duct typically arises from a point about 60 cm proximal to the ileocecal valve in adults. The Meckel diverticulum is an antimesenteric structure but receives its blood supply from the mesentery of the ileum. Thus, a typical feeding vessel (vitelline artery, also described as the omphalomesenteric mesentery) may be identified. It crosses from the mesentery of the ileum, across the intestine itself, and along the length of the diverticulum. This feeding vessel must be individually clipped and divided during a laparoscopic Meckel diverticulectomy. Meckel diverticula may contain ectopic tissue. The two most common types are gastric mucosa and pancreatic tissue. 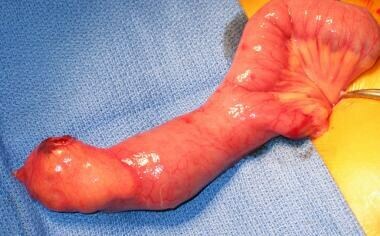 As many as 50% of all diverticula contain gastric mucosa, whereas 5% contain pancreatic tissue. Ectopic gastric mucosa results in secretion of acid onto adjacent ileal mucosa, causing ulceration and bleeding. The existence of a Meckel diverticulum or one of its variants is due to simple embryology. The yolk sac of the developing embryo is connected to the primitive gut by the yolk stalk or vitelline (ie, omphalomesenteric) duct. This structure typically regresses between weeks 5 and 7 of fetal life. If this process of regression fails, various anomalies can occur. This spectrum of defects includes a Meckel diverticulum, a fibrous cord attaching the distal ileum to the abdominal wall, an umbilical-intestinal fistula, a mucosa-lined cyst, or an umbilical sinus. Various possible complications are associated with different omphalomesenteric remnants (see the image below). Diagram depicting possible complications associated with different omphalomesenteric remnants. Meckel diverticula are symptomatic in 4-35% of patients. Infants and young children are more likely to present with symptoms. (A) Meckel diverticulitis. These are true diverticula, which usually become inflamed from obstruction. (B) Meckel diverticula, which may contain ectopic gastric, pancreatic, or colonic mucosa. In gastric ectopic mucosa, acid secreted from parietal cells erodes adjacent intestinal mucosa, generating ulcers at base of diverticulum. (C) Omphalomesenteric (vitelline) duct, which connects primitive gut to yolk sac. It normally regresses between weeks 5 and 7 of fetal life. When failed regression results in fibrous band, midgut may volvulate around it. 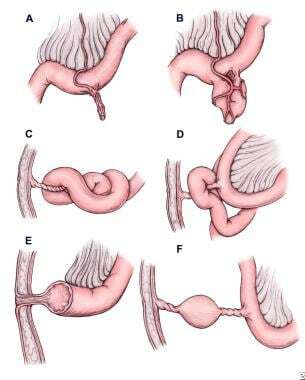 (D) Fibrous bands, which also produce abnormal peritoneal spaces through which internal hernia may result. (E) Omphalointestinal fistula. If patent connection persists between intestine and umbilicus, entity is recognized as omphalointestinal fistula. (F) Persistent fibrous cord with cyst. Failed regression of vitelline duct may also lead to umbilical polyps, umbilical sinus, or umbilical cyst. Image courtesy of Jaime Shalkow, MD. Meckel diverticula are found in approximately 2% of the population. The prevalence of symptomatic Meckel diverticula is estimated to be 4-35% of the at-risk population, depending on the age group studied. More than 60% of patients who develop symptoms from this anomaly are aged 2 years or younger. Patients typically do not have further bleeding episodes once the Meckel diverticulum and ectopic gastric mucosa have been excised. Patients who require exploratory laparotomy for bowel obstruction are at risk for adhesive bowel obstruction in the future. Menezes M, Tareen F, Saeed A, Khan N, Puri P. Symptomatic Meckel's diverticulum in children: a 16-year review. Pediatr Surg Int. March/2008. 24(5):575-7. [Medline]. Lin XK, Huang XZ, Bao XZ, Zheng N, Xia QZ, Chen CD. Clinical characteristics of Meckel diverticulum in children: A retrospective review of a 15-year single-center experience. Medicine (Baltimore). 2017 Aug. 96 (32):e7760. [Medline]. [Full Text]. Sinha CK, Pallewatte A, Easty M, De Coppi P, Pierro A, Misra D, et al. Meckel's scan in children: a review of 183 cases referred to two paediatric surgery specialist centres over 18 years. Pediatr Surg Int. 2013 May. 29 (5):511-7. [Medline]. Vali R, Daneman A, McQuattie S, Shammas A. The value of repeat scintigraphy in patients with a high clinical suspicion for Meckel diverticulum after a negative or equivocal first Meckel scan. Pediatr Radiol. 2015 Sep. 45 (10):1506-14. [Medline]. Poulsen KA, Qvist N. Sodium pertechnetate scintigraphy in detection of Meckel's diverticulum: is it usable?. Eur J Pediatr Surg. 2000. 10(4):228-31. [Medline]. Swaniker F, Soldes O, Hirschl RB. The utility of technetium 99m pertechnetate scintigraphy in the evaluation of patients with Meckel's diverticulum. J Pediatr Surg. 1999. 34(5):760-4. [Medline]. He Q, Zhang YL, Xiao B, Jiang B, Bai Y, Zhi FC. Double-balloon enteroscopy for diagnosis of Meckel's diverticulum: comparison with operative findings and capsule endoscopy. Surgery. 2013 Apr. 153(4):549-54. [Medline]. Krstic SN, Martinov JB, Sokic-Milutinovic AD, Milosavljevic TN, Krstic MN. Capsule endoscopy is useful diagnostic tool for diagnosing Meckel's diverticulum. Eur J Gastroenterol Hepatol. 2016 Jun. 28 (6):702-7. [Medline]. Lorenzen AW, O'Dorisio TM, Howe JR. Neuroendocrine tumors arising in Meckel's diverticula: frequency of advanced disease warrants aggressive management. J Gastrointest Surg. 2013 Jun. 17(6):1084-91. [Medline]. Chan KW, Lee KH, Mou JW, Cheung ST, Tam YH. Laparoscopic management of complicated Meckel's diverticulum in children: a 10-year review. Surg Endosc. 2008 Jun. 22(6):1509-12. [Medline]. Alemayehu H, Stringel G, Lo IJ, Golden J, Pandya S, McBride W, et al. Laparoscopy and complicated meckel diverticulum in children. JSLS. 2014 Jul-Sep. 18 (3):[Medline]. Test of choice for bleeding Meckel diverticulum is technetium-99m pertechnetate isotope scan (Meckel scan). It concentrates isotope in ectopic gastric mucosa, with sensitivity of 85% and specificity of 95%. In this scan, isotope is seen in stomach and bladder (normal), with radiotracer signal in midabdomen, suggesting presence of Meckel diverticulum with ectopic gastric mucosa. Image courtesy of Jaime Shalkow, MD. Laparoscopic image courtesy of Charles L Snyder, MD. Meckel diverticulum has been opened after resection, revealing ulcer and ectopic tissue, as indicated by forceps. Image courtesy of Richard A Falcone, Jr, MD. Resected Meckel diverticulum demonstrating ulcer.